PayPal (s ebay) has been a powerhouse in online payments but it hasn’t really cracked the much bigger market for payments for goods in the real world. Now, the company is starting to show off how it can put all of its components and recent acquisitions together to form a broad tool for mobile payments. PayPal hosted a partner event for retailers yesterday and began explaining how they’ll be able to implement its tools for in-store payments. The big reveal will happen next month at PayPal’s developer conference in San Francisco, but the company showed a glimpse of how it’s marshaling its resources. It’s important for PayPal to step up with a compelling offering because the mobile payments market is getting crowded with options like Square, Google Wallet (s goog) and upcoming services like Isis from the cellular carriers and digital wallets from credit card companies. Scott Thompson, president of PayPal, said in a blog post the company is looking to be a one-stop shop for merchants to help them address every part of the shopping lifecycle. OK, that’s a bit of jargon, but it means PayPal is going to help push out targeted advertising, help with in-store discovery and improve transactions with a handful of options. In a video provided by PayPal, it shows how users will be able to walk into a store and check in to a location to unlock discounts and coupons. When a consumer goes to check out, he’ll be able to pay by entering his phone number. That leverages eBay’s purchase of Zong and its carrier billing capabilities, though it’s not clear how much easier or more convenient that is for consumers who pay with a credit card swipe. But it does open up the option to use carrier billing for physical goods in-store, which is good for people without a card, though the question of how large the transactions fees will be is important. Right now, carrier billing fees are still much higher than credit card fees, which might deter some merchants. Users will also be able to scan items in-store and pay for them with PayPal without having to get in line. Customers can just flash their phone to an employee who will confirm the purchase. This is very much like AisleBuyer and it sounds like PayPal is looking to bring this to restaurant bills as well, something Thompson hinted at in his blog post. This is a cool step that makes sense for people who want to get in and out quickly. Customers will be able to apparently pay ahead for coffee ahead of time and pick it up. Users will also be able to choose how they pay for something after the purchase with PayPal Credit, which seems to leverage eBay’s BillMeLater. All of this appears to work through PayPal’s mobile application and doesn’t seem to require any new investments by merchants. That’s a big concern for mobile payments built on near field communication, which requires many businesses to upgrade their point-of-sale terminals to handle contactless payments. The new mobile payment tools don’t appear to include NFC payments. PayPal recently introduced person-to-person payments using NFC on Android devices, but the company told me at the time it was just focusing NFC on P2P payments. It sounds like PayPal is trying to work around the hardware constraints of NFC payments at point of sale. Other shopping features on display included the ability to get push notifications for discounts that can be shared, which appears to build off eBay’s acquisition of WHERE. Consumers will also be able to scan an item in store and find inventory at other locations, something eBay got from its RedLaser and Milo pick-ups. It’s unclear how soon all of this will come together and how many merchants will sign on. But providing a complete service for retailers and businesses to not only push out offers and discounts but also complete the transactions makes sense. 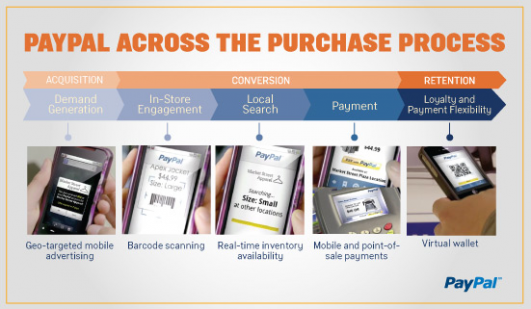 Merchants can close the loop on transactions and understand how their marketing is doing. This is essentially what Google is trying to do with Google Wallet and Offers though it’s focusing primarily on facilitating targeted marketing, rather than taking a cut of transactions. PayPal’s payment initiative is part of eBay’s broader commerce platform called X.commerce, which it’s building off the acquisition of Magento. But there’s also a lot of questions to be answered. 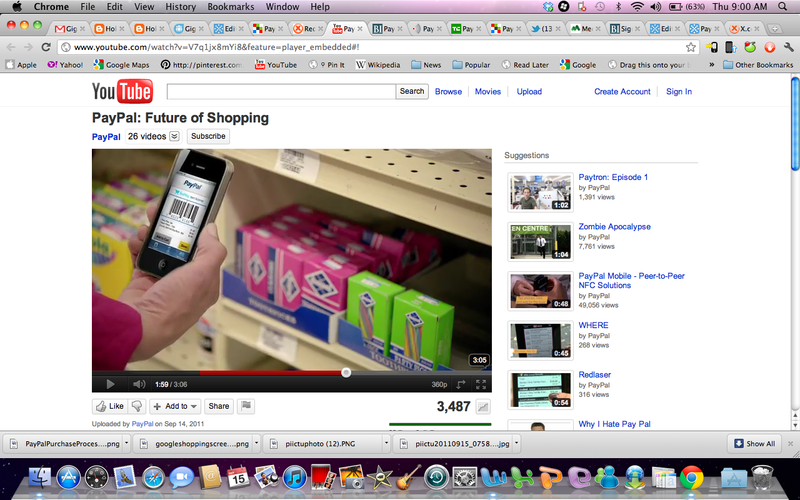 For instance, will consumers find this more convenient than a card swipe? Will PayPal make it any easier for people to set-up and manage accounts? Do all of these parts work well together in one solution? 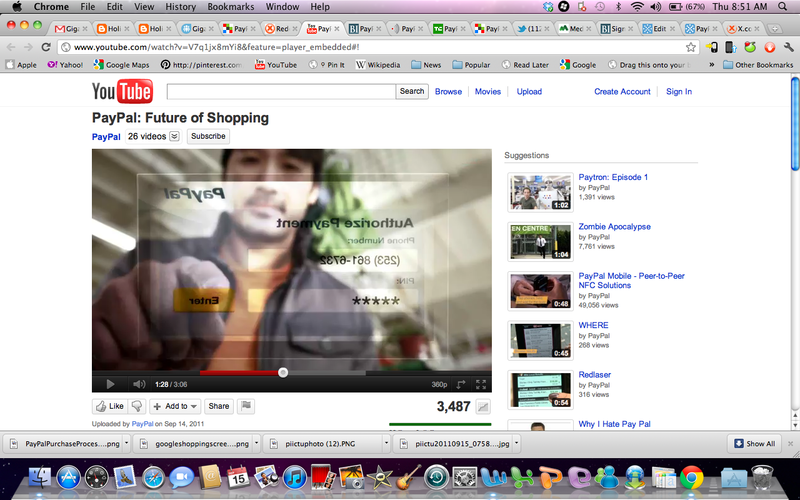 And how aggressive will PayPal be in selling this to merchants and consumers? I’ll be interested to hear more and I think PayPal can be a big contender if it gets its execution right. This is going to be a big market but it will require not only great tools but a lot of smart selling to consumers and merchants. The real question is, when in the US “banking” regulator going to finally do something about this unregulated, most unprofessional â€œfinancialâ€ operator that acts more like a bank but is actually no more than a money gouging arm of the Hoâ€™s â€œeBafiaâ€? Regardless, the fact is the rusting old hulk â€œeBayâ€ is presently being kept afloat by the clunky PreyPal so its good to see threats to PreyPalâ€™s clunky operation now coming thick and fast. Itâ€™s interesting times for all we eBay â€œhatersâ€ (oops, I mean â€œwatchersâ€). I just hope that someone has remembered to bring the popcorn. Even though PayPal clearly offers banking-type services (ie, holding depositorsâ€™ money in non-prudentially regulated and non-FDIC insured banking-type accounts), PayPal is mostly registered in various places not as a â€œbankâ€ nor as a provider of credit but only as a â€œmoney transmitterâ€ (like Western Union), and indeed PayPal has claimed that they are not even a â€œpayment networkâ€, and there is a minute degree of truth in that claim because it could, somewhat nonsensically, be put that most (but not all) of their activities do no more than facilitate the transmission of money by riding on the back of the banksâ€™ existing payments processing systems. In fact, the only thing creative about PayPal has been their founding use of usersâ€™ email addresses as an identifier for online payment transactions. PayPal is otherwise no more than a blood-sucking parasite riding on the back of, and in the main cannot function except via, the banksâ€™ existing payments processing systems. PayPal, outside of whatever will ultimately be left of the Donahoe-devastated eBay Marketplace, will undoubtedly eventually be consigned to the history books by the retail banks/Visa/Mastercard once those players get their â€œonlineâ€ act together. There is nothing surer than the sun will rise in the morning. Mmm… How about making paypal gift cards like itune ones. I would love to use paypal to pay for bit locker sites with cash.